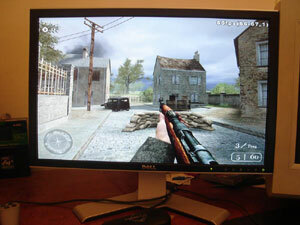 Next I fired up Call of Duty 2 just to see what the fuss was about this widescreen gaming thing. My initial response after reconfiguring the game to deal with the new resolution (which it supports by default), was a jaw dropping wow! I think every gamer needs to see what they're missing out on. I just wish more games supported the widescreen format properly. The last thing I tested in this review was the image quality with a couple of different video formats just to see how well they scaled and displayed. 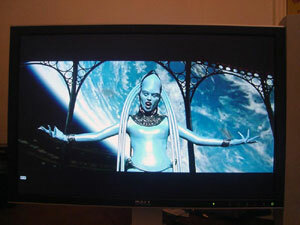 First off the bat was my old favourite, The Fifth Element. I always like watching the operatic scene for the music and more importantly in this case, the colours. The photos really don't do it justice as in real life the screen is far more impressive for video viewing. You've got to remember all these movies were intended for widescreen viewing, so it's quite at home on the 2407FPW. Last but not least I remembered I had the WMV 1080i demo video called 'Step Into Liquid'. The extra resolution and detail offered in this clip is a sizeable leap up from DVD quality and reassured me that the next generation formats (BluRay & HDVD) actually had something worth while for myself. Previously I hadnt really seen a purpose to a higher resolution video, but after watching this through a couple of time I'm keen for even higher resolution video still! Just to let you know, the camera I used for these photos (Sony DSC-LC1) has a tendency to do its metering within the centre 10% of the image and then completely ignore the rest of the viewing area. This means that the actual display area of the LCD screen is usually correctly metered, the background is completely out of kilt. So in conclusion, so far I'm completely pleased with the Dell 2407FPW. It's a great LCD monitor and certainly a huge step up from the last large LCD I spent any time with (a horrible 24ms Viewsonic 21"). Anyone who is holding off getting an LCD - unless you really do spend every waking hour doing photoadjustments, just go get an LCD like this Dell and then kick yourself for not doing it sooner. 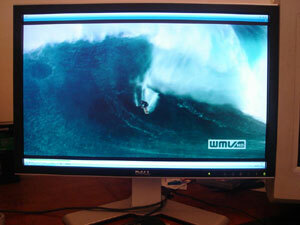 Specifically, this Dell 2407 LCD is the pick of the bunch when price vs performance is the decider. There are panels with better image quality out there (Eizo), but they certainly do come with the higher price tag. Really well designed base and mounting, nice unobtrusive thin bezel. My only qualm and the reason I marked it down is that to push the buttons on the bottom right of the screen I find I have to put my fingers behind it and use the buttons with my thumb. Something like nice light touch sensitive buttons would've been perfect, but I guess it would increase the price. Every single pixel is brilliant! I've used other LCD's in the past and for clarity I almost always have to give a 10/10. They're a joy to use. I'm still comparing this to my 201P in this regard, so the reduction in visible colour range is what caused me to mark it down the most. 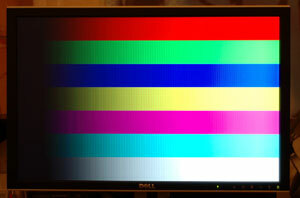 Black, whilst being pretty good for an LCD is still not black enough for my liking. I felt in games this wasnt an issue, but in movies it was slightly irritating. The major downfall for the 2407FPW is that to get the colour response it's capable of you have to wind the brightness up to retina burning levels which I'm just not willing to do. My compromise was to leave the brightness on 20-30, as higher than that was unbearable for me. The supposed lag that is present on some LCD's I though I was experiencing until i enabled VSync and from then on it was near perfect. An ever so slight lag compared to my 144hz gaming on my CRT, but still very very good. Even with my high expectations I had very very little if no ghosting at all. The Dell really is the cheapest 24" widescreen 1920x1200 computer LCD money can buy. I really did try to find something that compared in the money stakes, but nothing came close. The reason I marked it down is that it's a monstrous jump up from the price of the 20" widescreens - so much so that I could've easily purchased 2x 20" for the price of the single 24"! The warranty is what made be give it the extra half a point; as I opted for the 5 year warranty, I know that if it decides to bite the dust at any point in time, I've got a replacement monitor (in theory) the day after I call Dell. All the previous niggling issues with the 2407 appear to have been ironed out, leaving none of the benefits of purchasing a 2405 (IMHO). I wouldn't trade my 2407 for an 2405 any day of the week. Top quality monitor, at a pretty good price. My only complaint is simply one of a CRT user at heart, and thats in regards to the contrast and the slightly incomplete colour range - again ONLY compared to a top quality CRT. As LCD's go, this one is a brilliant buy. As a little post script, I felt it important to note that despite the secure packaging my monitor came in there was evidence of physical damage to the plastic bezel and to the panel itself. Nothing major but certainly something that I'll be discussing with Dell in the near future; simply a scuff mark approximately 14mm long that will definitely not buff off. 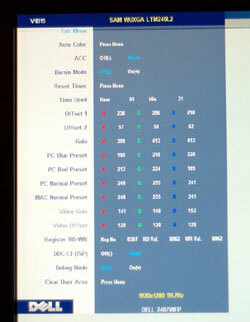 The monitor has a built-in card-reader and USB hub. The card reader's performance reading off a Kingston Elite Pro 512mb compact flash card managed to pull 155mb in 26 seconds, which makes it 5.96mb per second. Secondly, in regards to the banding I decided to take some photos with the test colour gradients in the various image modes just to show everyone the difference. Really, the pictures speak for themselves. 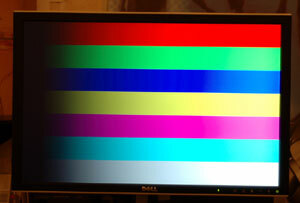 First up is the fullscreen gradient test in 'Desktop' image mode. This is the mode that has the Faroudja image processing disabled in the Rev A02 model. Next up is exactly the same image in the 'Multimedia' image mode. Lastly a photo showing the firmware and panel version. Note from Agg: This article started life as this thread - you can see other comments and join in the discussion there.